Arthur B. Whipple, 82, a life long resident of Swanzey died unexpectedly on Saturday, June 4, 2016 at Monadnock Community Hospital in Peterborough. He passed peacefully while sleeping with his son near. Arthur was born the son of the late Myrtle (Whipple) and Matthew Whitten on August 18, 1933 in Swanzey. He was educated locally and attended schools in Swanzey. Soon after school, Art enlisted in the U.S. Army. 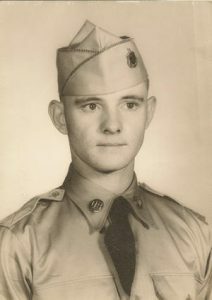 He served his country during the Korean War and was honorably discharged at the rank of Private First Class. On October 5, 1956 Art exchanged vows with Arlene Mackey. Sadly, Arlene passed in 1992. Art was fortunate to find love once again and married Elizabeth A. Young. They were married with family and friends at the Veterans of Foreign Wars, Daily Whipple Post in Keene. She too passed away on February 4, 2013 after eleven years of marriage. Art worked for the Town of Swanzey in the Parks and Cemeteries Department as a maintenance person. Prior, Art was a machinist at Kingsbury Machine and tool for over thirty years as a machinist. He was an avid outdoorsman. Art loved to be with nature. He was a trapper, hunter and hiker. He enjoyed camping and being in god’s country. Art was a volunteer teacher for the New Hampshire Dept of Fish and Wildlife teaching trapping educational courses. He also worked on conservation projects trapping and tagging animals. He was inducted into the New Hampshire Trappers Hall of Fame in 2013 for outstanding achievement in wild life management. Art was an amateur Archeologist. He found an American Indian sight which was named for him. He was also a long time member of the VFW in Keene for many years. Mr. Whipple is survived by his son, Art S. Whipple of Swanzey. His siblings; Marion Greene and her husband Warren of Brattleboro, VT. and David Whipple and his wife Lena of Swanzey. He also leaves; nieces, nephews, extended family and friends. He leaves his companion, Norma Callahan of Troy. Art is pre-deceased by his daughter Yvonne M. Whipple who passed on April 9, 2015.